This page describes how the qdsync protocol works. Individual commands are documented below. The qdsync protocol is a line-oriented protocol that can be implemented on top of a socket. It consists of a number of required commands and some optional commands. While there is no formal state machine there is an expected order of message arrival. The basic process looks like this. 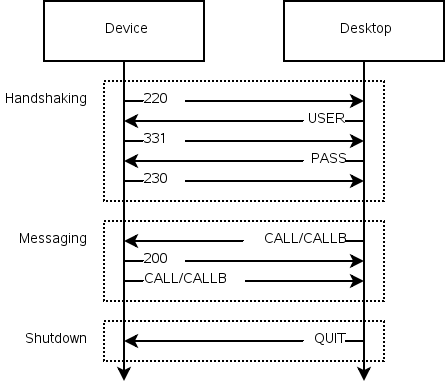 When a connection is initiated the device will send a 220 message. The desktop sends a USER message. The device responds with a 331 message. The desktop sends a PASS message. The device responds with a 230 message. The desktop and device can now send CALL or CALLB messages. The device responds to these with 200 messages (unless disabled with HELPER_INIT). The connection is ended when the desktop sends a QUIT message. Additionally, once the desktop has sent the HELPER_INIT message the device expects to receive a message of some kind within the specified duration period. The HELPER_PING and HELPER_ACK commands exist for this purpose. The HELPER_QUIT command is used by the device to indicate failure to send a command in the specified time. 211 Have a nice day!